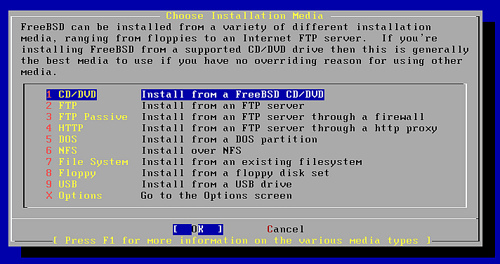 Sysinstall, the FreeBSD install/configure program, will prompt, asking which type of install is going to be performed. A 'Standard Install' is the preferred option. 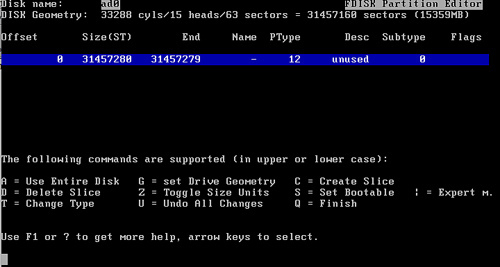 Partitioning - A prompt will appear introducing "FDisk", the next step, and providing suggestions. Read all of the prompts and choose the best option. 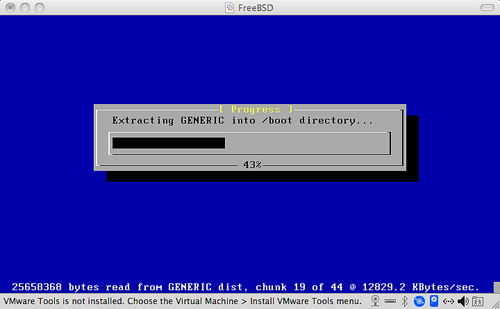 In this example, I'll dedicate all of the space on the HDD to FreeBSD. Test environments are one thing, but production computers should not dual-boot. 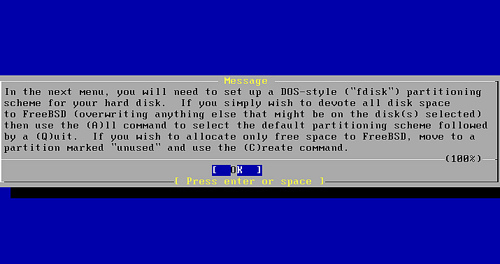 Press 'A' to use the entire disk for the installation and then press 'Q' to finish and commit changes to the disk. 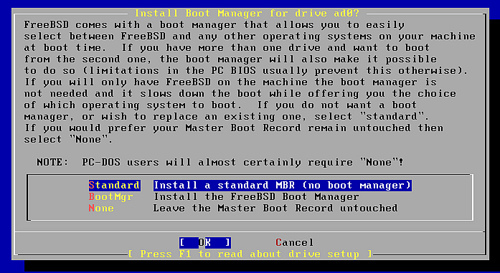 Sysinstall will ask which type of bootloader should be installed. The "Standard" boot manager will suffice. Slices, or volumes will need to be created to host the various parts of the operating system. FreeBSD, like Unix, and Linux can have many of it's essential directories split into distinct partitions. Once again, press 'A' to have sysinstall create the default layout and then 'Q' to quit/continue. What type of install, will be the next prompt. Scroll down the list and select 'User' by pressing the Spacebar. 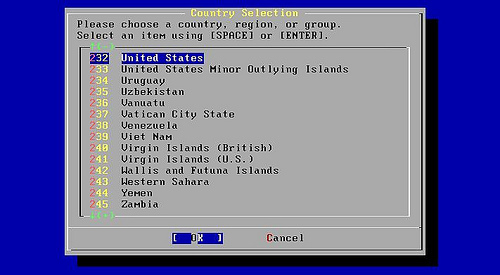 When asked whether or not the ports collection should be installed, select yes an press Enter to continue. 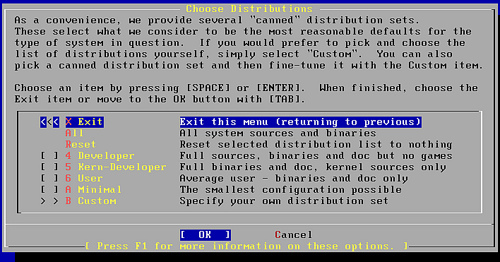 When placed back in the distributions dialog, choose the Tab key to get to the 'OK' option and press Enter. Choose 'CD/DVD' as the installation source by pressing the Enter key. Finally, sysinstall with give a final prompt, allowing cancellation of the install process before committing the selected changes to disk. Congrats! 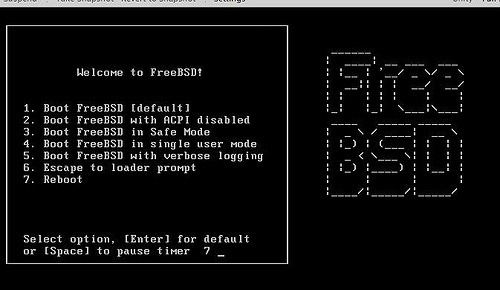 The install has completed, but we are far from done -- a whole world of FreeBSD awaits you!